At least I got to see OT and witness more Matthews magic. of course it was Matthews. Oh right, hockey is still a thing. 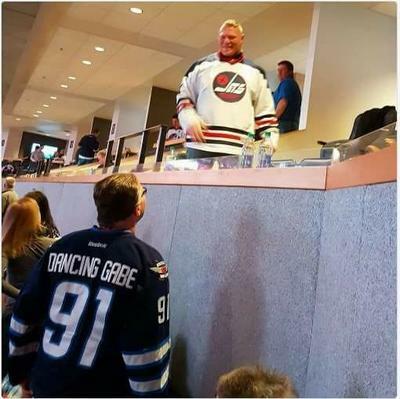 Not my photo, popped up on facebook, but here he is meeting Winnipeg legend Dancing Gabe. That's all kinds of surreal. Sable and their two sons were up there as well. Nobody gave Sable a jersey though. Point # 1000 for Ovi tonight vs Penguanos. I won two tickets to an Isles-Devils game at Barclays with a total $300 face value. I think second prize was four tickets. Calling the Rams and Chargers "professional football teams" is a stretch. Imagine trying to explain to someone 5 years ago that California would have 4 NFL teams and the most professional by far would be the Raiders. Who arent long for the state. Read Islanders vs Rangers (a definitive look at the history of that rivalry) by Stan Fischler. Tremendous book and highly recommended. As someone who has been at those games I can say that they are as close to an Old Firm match as you will find in American sports (and 20 years ago was like 5x as crazy as today with de facto riots in the stands and outside in the parking lots/streets). The only rivalry in the league in the same stratosphere is the Battle of Alberta. Canes do it again beating the Isles 7-4 to finish the homestand 4-0-0. Canes move to a point behind Philly for the last playoff spot. Going 14-1-1 at home since November has helped tremendously and people are starting to show back up to the building which was desperately needed. Finishing January they have games @ Columbus, vs. Pittsburgh, @ Columbus, @ Washington, vs. LA, vs. Philly. I think this stretch will tell if they are going to hang in there or will I continue to hate hockey for another year. BRING PLAYOFF HOCKEY TO RALEIGH~! Oilers comprehensively outplayed, beat Flames anyway because we actually have a real live goalie man. Johnny Gaudreau's shootout effort was Sedin levels of terribad. That's definitely a great rivalry but I don't think it brings out the seething hatred among fans in the stands and part of that is they play in two different cities. Battle of NY is insane because they are separated by a few miles (used to be separated by 25 miles). That's not to say the Habs and Bruins fans can't be nuts but I don't think those games have the level of violence in the stands or streets after the game.